Urethane seat impact bumpers produced by Plan Tech are top of the line! So, are you in need of urethane seat impact bumpers? Plan Tech is the best choice for you. We use 100% pure polyurethane to manufacture urethane impact bumpers for the automobile and industrial industries because of the strong characteristics of urethane. Urethane enables industrial manufacturers to produce lightweight parts and components. The rubber seat impact bumpers are used because of its outstanding overall performance. The presence of urethane in car seats enables it to be shock-absorbing, comfortable and soft. More so, urethane has the ability to absorb shock in the case of a collision. This makes it an important ingredient for the production of bumpers. Our urethane seat impact bumpers withstand more loads because of their flexibility property. Also, they are abrasion resistance, even in high wear environments. 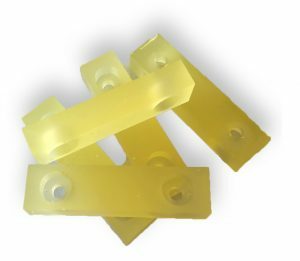 Urethane also provides high resiliency; they can withstand high vibration frequency and are very tough material. Plan Tech specializes in the manufacture of polyurethane seat impact parts. Our in house engineers will not just help you design and customize your rubber seat impact bumpers, we also help you determine the perfect specification or description of any tool you need. With over 30 years of experience – you can’t go wrong with Plan Tech. Are you interested in cast Urethane Seat Impact Bumpers? Please Contact us so we can help solve your requirements and work with you on your specific application!